Dionysus is excited to announce two new releases! 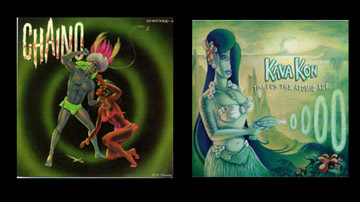 Kava Kon’s Tiki For The Atomic Age (Dionysus) and Chaino’s Eye Of The Spectre (Bacchus Archives) are both now available on vinyl and CD from our online store! Read Jason Gelt’s review now! Just in: Issue #16 of The Continental magazine with CD! In case you don’t already know, The Continental is probably the coolest lil’ mag out there devoted to surf, twist, and rock ‘n’ roll, with several back issues selling for incredibly stupid amount$ on Ebay! Issue #16 includes ginormous features on Laika & The Cosmonauts, The Barbwires, and James Bond music, and — probably most exciting of all — a 22 song CD filled with great surf, instro, and garage rock tunes! Get your copy NOW before they all disappear! Find it on the front page of our online store. We just added a ton of cool new garage, power pop, KBD, and original 7″ pressings to our online store, plus we now have an entire section devoted entirely to Germany’s masked garage rock marauders The Satelliters that includes all of their Dionysus releases as well as a slew of rare and hard-to-find titles!